Agneepath is a 1990 Indian Bollywood action film released on Feb 16, 1990. The film is directed by Mukul S. Anand, produced by Yash Johar. This is the story of a young boy and his way to deal with the problems. His family gets devastated by a villain. So in order to seek revenge against this, he plots himself against all the crimes and then kills the villain. Dinanath Chauhan is a school master and he teaches his village the rights and wrongs. But, one day he is hanged by the villagers because they are under the influence of Kancha. Now, Kancha is the villain who actually runs many illegal businesses. So, Dinanath son, Vijay and his mother are forced to leave the village. Now one day, even Vijay commits a sin and he leaves his mother. He enters the underworld. But, he is supported by many people. Vijay grows to become a gangster and works in his own ways. Now, he wants to take revenge from Kancha and would hang him in the same way as his father was hanged. He does this, but in the end even he is killed and the entire family gets into troubles. 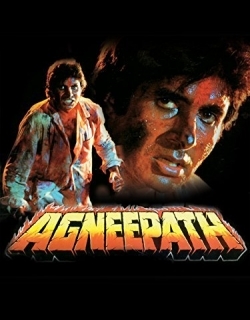 Agneepath is the story of a young boy whose father has been mercilessly killed by an evil personality. He wants to take revenge of his father's death. He plans to teach a lesson to the gangster and with each day he becomes more and more like his enemies. Vijay (Amitabh Bachchan) is the son of Master Dinanath Chauhan, the village schoolmaster. In his childhood, he sees his father being brutally and publicly killed by villagers, after being framed by Kancha Cheena (Danny Denzongpa). The family is then forced to leave the village. Vijay takes a pledge that he will avenge his father's death. He then looks after his sister and mother by becoming a gangster himself. As he becomes more sucessful he finally meets those people who killed his father. He and his family are now, once again in danger. Is Vijay able to take his revenge. Agneepath is a powerful tale of Vijay's journey. The hero Vijay Chauhan aka Bhai (Bhachchan) witnesses his schoolmaster father (Nath) being falsely implicated in a scandal with a prostitute and lynched by the villagers. Bhai grows up to become a gangster and encounters the main villain Kancha Cheena (Denzongpa) in a luxurious place in Mauritius. He joins the villains gang only to have him arrested by the police. When Cheena is released (by arranging to have a key eyewitness killed), the hero murders Cheena after negotiating the path of fire referred to in the films title. The most violent of Bachchans recent films, it was also the most sustained effort to rehabiliate the politically discredited star. The title and opening sequences borrow from a poem by Bachchans father Harivanshrai Bachchan, and show todays New Man walking through the fires of hell to redeem a brutalised world and make it into a new utopia. The mother obsession of Bachchans previous films is still evidence. In spite of Mukul Anands usual fast-moving camera and distorted prespectives, the film occasionally lapses into earlier cinematic idioms (e.g. the foot-stomping song picturisation of Archana Puran Singhs Alibaba song). Anands familiar anarchronisms suggest that they very different historical epochs are actually very similar: an exotic James Bond-type tourist resort and the blood and stench of Bombays gang wars. 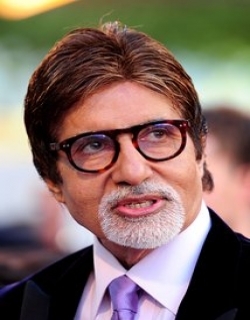 Although still playing the vigilnte hero, bachchan initially abandoned his well-known baritone voice to suggest an older man speaking in a heavy Bombay Hindi accent, but he later had to re-dub the voice when the experiment proved unpopular. The film was not a major hit. [Source: Encl] Check out this page for more updates on Agneepath. 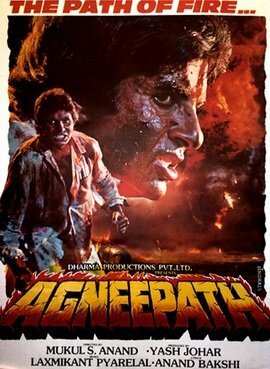 This page provides latest and updated information about Agneepath (1990) movie which released on Feb 16, 1990. 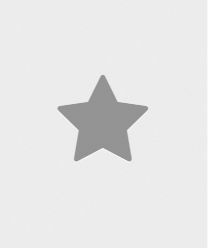 Agneepath (1990) is directed by , produced by , starring .We have also provided 0 trailers and videos, 5 photos, 64 user reviews, and 0 critic reviews.Agneepath (1990) has received 4 rating from user reviews.The overall rating of Agneepath (1990) is 79 and movie is 4.Agneepath (1990) has won 0.003 crore awards.You can review, like, dislike this movie and also can add to favorites. You can also find information on showtimes, CDs, DVDs, online rental, online free watching.